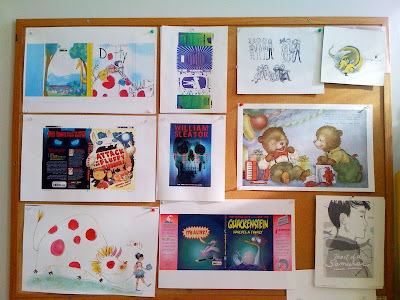 This month's bulletin board features a rough jacket layout for Erica Perl and Julia Denos's DOTTY. Below that is the cover layout for Andrea Beaty and Dan Santat's ATTACK OF THE FLUFFY BUNNIES which features comics by Dan Santat. Below is a spread from DOTTY. Back up top we have a Spot Uv Layer ( that drove me nutso) for the Jacket of THE FIZZY WHIZ KID by Maiya Williams. Below we have the paperback version of William Sleator's TEST. Below that is one another jacket layout this time for QUACKENSTEIN Hatches a Family by Sudipta Bardhan-Quallen and Brian T. Jones. Back up top are Christine Norrie's character sketches for Lauren Myracle's new Luv Ya Bunches book. Next to that is a piece of Kelly Murphy's art for OVER AT THE CASTLE. Just below that is a spread from OTIS & SYDNEY and the Best Birthday Ever by Laura Numeroff and Dan Andreasen. Lastly we have a sketch for the upcoming novel HEART OF A SAMURAI. It's great to see all those fun illustrations in one spot. Cool post! Always love Santat. And "Dotty" looks lovely, can't wait to see it in hand!